An all-natural solution that clears most hot spots and Demodex in just 2-3 days. This skin-safe hot spot spray provides long-lasting relief, prevents repeat symptoms, and works on fungal, bacterial, yeast, and skin mite infections. Long-Lasting Relief Keeps Your Pet Happy! Hot spots can be painful for your pet – causing stress and long-term discomfort. Worse, they mean you get stuck with a sky-high vet bill. And what’s more? Those symptoms frequently come back – meaning more anxiety, and higher costs for you. That’s why we created EcoSpot, an all-natural hot spot spray for dogs and cats. No more scratching, no more pain. Just a simple, affordable, and earth-friendly hot spot spray that quickly clears up symptoms, protects your dog or cat from further infection, and keeps your best buddies happy, healthy, and itch-free. Now, you’re in control. Safe and effective, you’ve found a totally natural hot spot spray for your dog or cat. Finally, you can rest easy knowing you’ve made the right decision. A fast-acting formula that heals your pet in just 2-3 days! If your dog or cat is experiencing red and painful skin from biting and scratching, if you’re sick of spending hundreds of dollars on vet bills, and if you want to know you’re choosing the very best solution for your pet, then this fast-acting hot spot spray is the perfect choice. Of course, this all-natural hot spot spray only contains the very best, organic ingredients, including Organic Calendula Flower (Marigold) Extract, Organic Burdock Root Extract, and Organic Mullein Leaf Extract. Get this fast-acting hot spot spray for your dog or cat, and watch your best friend return to the happy, healthy, and energetic pet you love. Finally, an all-natural, skin-safe formula that clears hot spots and demodex AND protects your dog’s (or cat’s) skin from further infection. With EcoSpot hot spot spray close at hand, never again will you have to endure witnessing your dog or cat biting and scratching his skin because of demodex or other unknown infections. No more crying and moaning at the stars for the infection to just go away and leave his skin alone. NOTE: EcoSpot should only be used on pets 12 weeks and older - we do not recommend this product for puppies/kitties younger than 12 weeks. Works on all types of hot spots on dogs, including bloody chew wounds, irritations, and hairless areas. It works on cats, too! Treats hot spots caused by yeast, demodex, mites, fungus, and bacteria. Helps clear infected areas on the skin and allows hair growth. No-rinse formula allows you to apply a quick treatment spray in just seconds each day. All-natural, skin safe, non-toxic formula. Fresh, natural smell that both you and your dog (or cat) will be comfortable with. 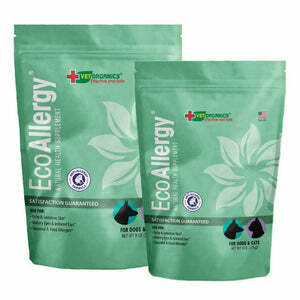 Like all Vet Organics products, EcoSpot Hot Spot formula is fully backed by our unconditional 100% money-back guarantee. Burdock Root is known to calm and heal a wide swath of common skin issues. This botanical extract is antispasmodic. It can help smooth muscle relaxation, especially in tubular organs of the gastrointestinal tract. This herb is quite effective for pain relief, as well as for arthritis and rheumatism. Its properties are antibacterial, antifungal, and antiviral, making it excellent for infections and other skin issues. Simply spray EcoSpot onto the affected areas, thoroughly saturating the skin, and allow to dry. EcoSpot may be used several times per day if needed. Can I use both EcoMange and EcoSpot at the same time? We normally do not recommend using both products at the same time. If you believe your dog is infected with mange, please visit our EcoMange page here. 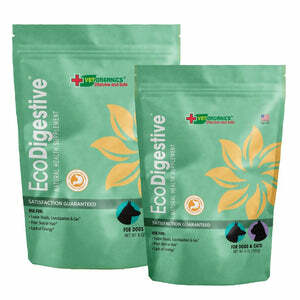 If you believe your dog has other skin issues other than mange, please visit the EcoSpot product page. Are your products toxic in anyway? Dogs lick their skin. EcoSpot will not harm your dog in any way if your dog licks his coat after spraying. When using EcoSpot, how much should I use? You should apply it generously so that the area is completely covered with EcoSpot. Initially, EcoSpot should be used at least twice per day, possibly more often for severe infections. It is a gentle formula and will not harm your dog with more frequent use.